But it’s easily fixed if you have your handbag kit. Your handbag kit is the essentials you keep in a little bag or pouch that you can transfer from handbag to handbag. My handbag kit is in a black Vogue pencil-case-looking zip bag. And along with nurofen and tampons, it has these 5 beauty products in case I’m ever in a jam (or forget to moisturise). Dry skin is never fun. I keep a tube of Vaseline Intensive Care Aloe Sooth moisturiser in my handbag as it’s multi purpose – hands, arms, legs etc – and doesn't prickle my skin. This is likely the one product you DO have in your handbag – but if you don’t, put one in there right now! I mean it, now! I’m a Lucas’ Papaw, Burt’s Bees or Go-To girl myself. When you need to go from day to night in a jiffy, having lipstick on hand is an instant fix. 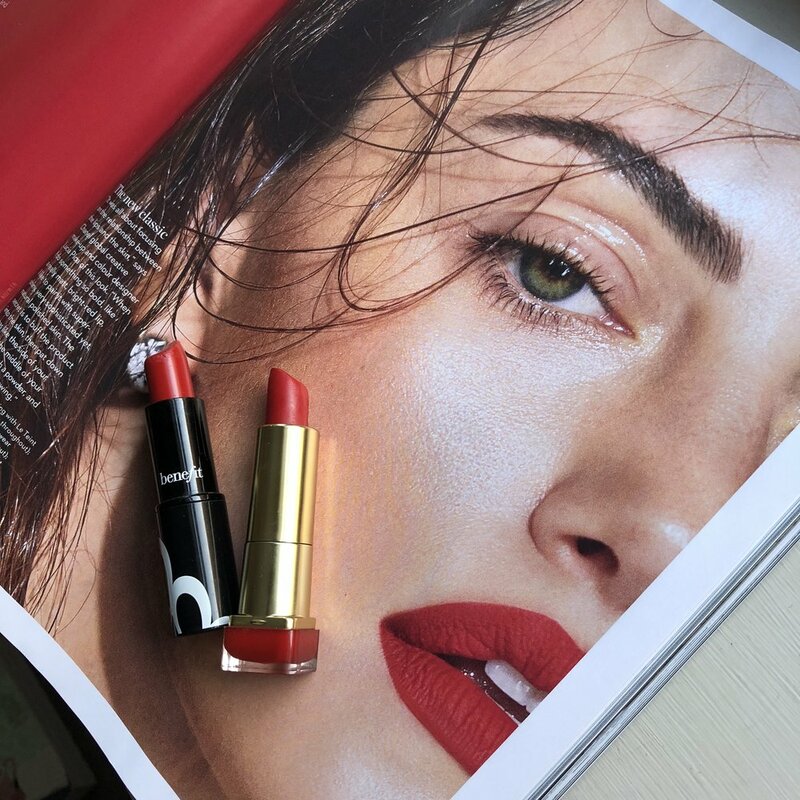 You'll never feel underdressed when wearing red lipstick. There is nothing worse then realising you’re on the wrong side of BO. It’s happened to the best of us. Keep a mini perfume in your bag and you’re only one spritz away from redemption. My favourite was the Benefit 'See or Be Seen Sascha' perfume. It was small and smelt divine. But of course, as is the case with any beauty product you love, it was discontinued. Now I have 'Play for her' by Givenchy or a mini 'Princess' by Vera Wang that I keep on rotation. Best to go mini or slim so it isn't too heavy. Keep a hair product in your bag that you can rely on to turn a drab ‘do into, well, something not-so-drab. If it's hairspray, have a mini hairspray. For me, it’s L’Oreal Tecniart Super Dust. The instant hair texture gives my hair volume, makes it easy to manipulate and helps it hold. Plus it's small and light enough to keep in your handbag at all times.